You are here: Home / About SPARKS! SPARKS! is an award-winning marketing communications agency with over fifty collective years of experience in creative and production services, helping organizations around the world. We partner with our Clients to better understand their business, their “why,” and their customers. Then, we put our experience to work and help them to share their message and reach their audiences. 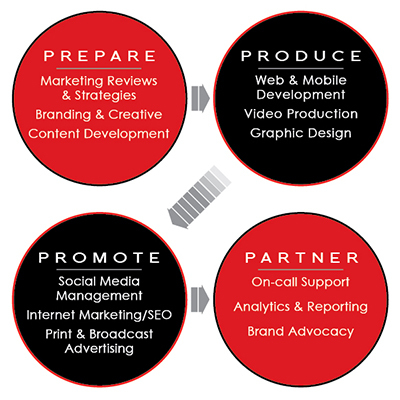 We’ve got our own “Four P’s of Marketing,” and we customize and integrate them to communicate your message and help your brand gains top-of-mind awareness. So whether you need a website, internet marketing campaign or a TV commercial, SPARKS! will focus on the message so you can focus on your business.